I originally posted this recipe several years ago; after having it for dinner last night I thought it deserved more attention and Wayback Wednesday was the perfect vehicle. 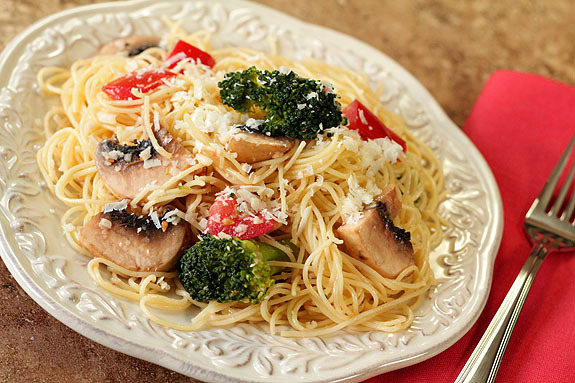 A pasta recipe combining broccoli, mushrooms and tomatoes seems in line with current trends that have seen pasta (and pizza) move from the realm of red sauce and meats to a variety of combinations that favor vegetables and what I consider a white sauce (typically made with olive oil and/or butter). So it might be surprising to know it’s from a cookbook that was my mother’s and is most likely from the late 50’s. It’s one of my all time favorites and I love that it’s SO old yet so current too! 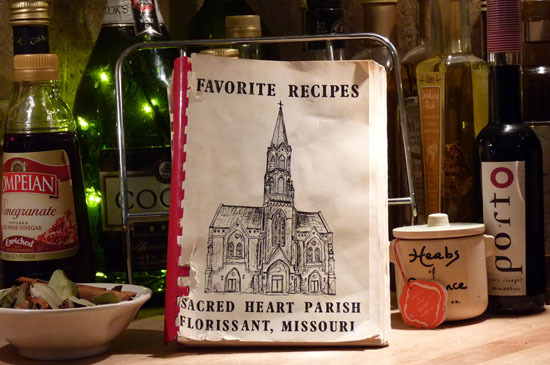 I now have the cookbook from Sacred Heart Parish in Florissant, MO in my library. It’s tattered and certainly worn and is typical of cookbooks put together by church groups. It’s bound with a red plastic spiral binder and several pages are missing from the back. I must have ‘borrowed’ this from my mother many, many years ago. What’s amusing even to me is that I have never used it but for two recipes; both of which I love. This pasta and another one for zucchini bread. I think this dish is most fabulous during the summer with the freshest of ingredients from the garden but I had an abundance of broccoli; some decent Roma tomatoes on the windowsill and a huge package of mushrooms that I needed to use so it was dinner last night. I’ve made some modifications from the original recipe. It calls for 1 pound of pasta and I think that is an LOT; I like a higher veggie to pasta ratio when I make it. I’ve also cut back on the butter which originally calls for one cup and even then I’ve substituted some of the butter with olive oil; I like using the two combined together; great flavor and while not less calories, less saturated fats! Do make sure you put the mushrooms and tomatoes in the bowl first and let the hot pasta steam them for a few minutes before mixing with the remaining ingredients; the mushrooms need that little bit of ‘cooking’ time to be just right! I just love this combination of ingredients; you must try it! A simple yet fabulous dish with fresh vegetables and pasta served with a buttery olive oil and Parmesan sauce. Simmer broccoli in approximately 2 quarts of salted hot water for a few seconds. Add uncooked spaghetti and cook for 8 minutes. (I prefer thin spaghetti...so adjust accordingly if you do and add to water after a couple of minutes). Put mushrooms and tomatoes in bottom of serving bowl. Drain broccoli and spaghetti in colander and put on top of vegetables in bowl and let it sit for a minute. Add Parmesan, butter, olive oil, lemon juice, salt and pepper; toss together and serve with some additional Parmesan grated on top. I love that this recipe not only looks delicious, but easy to make! I must try this one soon! Thanks for sharing! I’ve been making this for 30+ years Caryl and I never tire of it; hope you enjoy it too! I love the simple fresh ingredients in this flavorful pasta dish! This would be perfect for a quick weeknight dinner. Maddy has a newfound love of broccoli and mushrooms so I’m going to make this during the week. I’m sure we’re all going to love it! I love cookbooks like that and I find some real gems for everyday cooking in them. This pasta is my kind of supper. Simple and delicious, what could be better?! I always appreciate seeing the progression of your photos. So helpful to a beginner like me. I think your meal looks great– easy to put together yet satisfying. Thanks for the sweet compliment…especially because the ‘good’ photos are from two years ago when I made the dish and replaced just the photos! This really is a winner Holly; one of my favorite quick meals. This looks so good(minus the mushrooms) I’m one of those weird people that don’t like them. It looks like it would be a light dinner. I love this recipe! I think I have one nearly identical to it in one of my older cookbooks. And really…who even needs a big hunk of meat with all this goodness in a bowl! Isn’t that the truth? I remember when I first made it how unique I thought it was; you know, pasta without red sauce? Now…it’s not quite so unique in that regard but still so good! 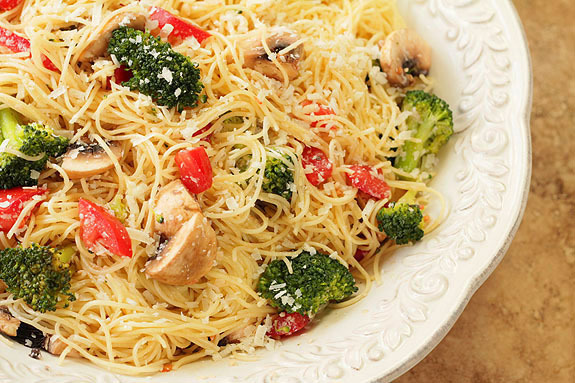 Tomatoes and broccoli work so well together in pasta, don’t they? And mushrooms are always welcome! And I know exactly where St. Heart’s is located. 😉 Fun to revive old recipes — and particularly, old photos! Heck, the ones I took last just a few months ago now make me cringe! I think the first time I made this it was a leap of faith since they didn’t seem like great partners…but of course that all changed! I do love reviving some old ones; I put all my favorites on here first and I’ve always said maybe one of my kids saw them but that’s about it! This is too good to not get further than that John! Great old church; I remember it well even though I was REALLY young! I don’t have any old cookbooks, so I will come and browse through your collection. I promise, I put them back where I found them. I love pasta dishes like this too! Aren’t those old group cookbooks great? I own a few of them myself! I love them; I should probably pass them on to someone else but there are so many memories it’s hard to even contemplate much less actually do! Absolutely colorful springtime inviting in so many ways. We love it. Can’t wait to try it…. Yum… to put it mildly! Hey, how’s my Man(Pans)? 🙂 It is perfect, hope you do try it. I have quite a collection of those old cookbooks and can spend hours looking through them. I wish I had more…not being in town with Dad has seen them go elsewhere so feel very fortunate that I have this one. Simple elegance…like the meals I remember growing up. This recipe, coupled with your pictures makes me wish I have smell-o-vision. Yum! I know that feeling Chris; for me? I’m ready for Smell-o-twitter too, aren’t you? I LOVE old church cookbooks. YOU always find little gems. They are the best things I inherited from my Nanny. She has one from Louisiana that I LOVE. The recipes are SOOOOOOOOOO unique! Let me know if you try it and if there is a new convert! My fiance’s mother gave me a couple of her church’s cookbooks last year for Christmas and I always find little gems in them every now and then! This pasta dish sounds delicious and refreshing! How great to have one of your mom’s cookbooks. It looks like a great pasta recipe. I do love this Barb. The photo of the cookbook sets the entire tone. I have a soft spot for anything vintage and bringing it back to life. It is with recipes like this that we remember how the roots of good dishes stay true to themselves over time, don’t they? This looks fresh, healthy with true flavors. I’ll be bookmarking this for a near future making. Thank you. I know…I love that cookbook; just seeing it takes me way back. I don’t remember it as a kid but I remember the church we went to as kids so it is very special. I love seeing tattered cookbooks. It reminds me of my favourites. And I love this pasta. I also stay away from strictly tomato sauce based pastas and love oil-based pasta loaded with vegetables like these. It looks delicious Barb! A variation of this is going to be my dinner tonight! Looks fantastic!!! Variations are US! I vary it a lot…this is from the original recipe but I use whatever veggies I have on hand as long as they are a good blend and provide some great color. You’ll have to let me know what you do! This beautiful pasta dish has made me very hungry! Thank you Maris for the sweet comment. I’m with you! I’ve added leftover chicken on occasion if serving to company that ‘might’ expect a protein. Feeding guys is a whole different story. I haven’t been married for years and have two girls so I’ve been lucky; there are no meat and potato or red sauce concerns here. Whew! I can’t imagine a more perfect pasta recipe. Is it wrong that I want this for breakfast right now? Funny how trends are cyclical. I also am making more and more pastas with olive oil and grated parmesan. This combonation broccoli mushrroom combination looks fantastic. So pretty and inviting! Though I’ve been making this for many years, one thing I love is that it did open my mind to thinking in this direction. I’ll do the same with a lot of veggies now switching out the broccoli for zucchini, asparagus, or peas. I do like keeping the green color; really brightens up the dish. Now this is my idea of a perfect meal! YUM!!! And I’m OK with making it a meal all by itself. I’ll serve it in the summer with grilled chicken since it’s great for a BBQ but for me the other night? No chicken required.